Personal goals as an artist: Conceptualizing alternative imagery depicting inner beauty, strength and struggle to be seen by women in today's social climate and help redefine the concepts of beauty through contemporary photography. This is some of my newest work, it is honest and vulnerable. I know the reality that lives behind her eyes and am so grateful for the love and trust that went into creating these images. That connection provided a glimpse into her soul and gave me the ability to share her depth with you. The Wraith of Eternal Creativity, silently she hovers and whirls around the field and in the minds eye. We constantly chase her sometimes missing her appearance for she floats lightly above the ground. She twirls without a sound. When I do catch a glimpse, when she reveals herself to me she becomes vivid in grace and beauty when I grasp for her she is vaporal a wisp of smoke that slides through my fingers reminding me that I cannot hold her for she is a spirit, a thought, a dream that I may not possess but merely borrow enlightenment from in the moments she deems me worthy, a precious spark of inspiration. This is the first image of a new series that I’m working collaboratively with Michelle Teague On. The entire series is being shot on location at Het Landhuis in Pittsboro NC but I will write another blog post this week about the entire event/series . What happened: The shoot was planned for later in the afternoon/day and the rest of the team had to head home. There was a miscommunication with the model that made the photo shoot run much later than expected. But I waited and as I waited the sun was traveling below the horizon pretty quickly. The model showed up and we jumped into action as I quickly explained that she was intended to be naturally lit and we had about five minutes to get ready. We ran out to the field and let me just commend her partner for being so incredibly helpful. We ran out into the field and she had to climb a ladder in almost total dark! Her partner did a great job swishing the fabric and the model gave me incredible poses. I left happy with the work we did together and everything but almost positive we didn’t have enough light. I really left there thinking we were going to be reshooting and totally knowing I was happy with the work we did. I couldn’t believe we pulled it off we had just enough light left to create something beautiful and natural. We created the feeling and the idea was conveyed through movement, light and the surroundings. 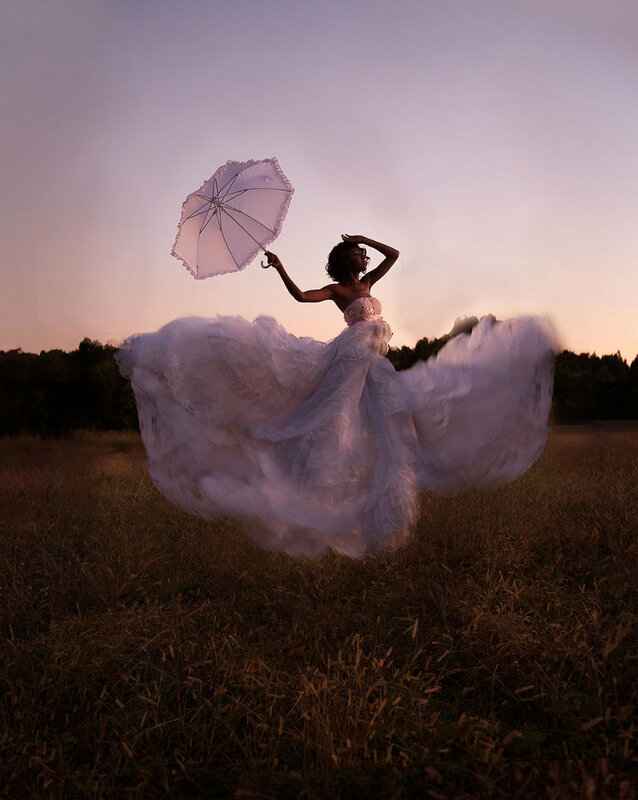 I want to thank everyone involved in creating this image; Michelle Teague my partner and co creator, Lisa and Chris Verwoerdt for their benevolence and use of their incredible space ( the series and is being created on their enchanted grounds), Jasmine Rhodes the model and her assistant. Beaver Queen 2017! Check out some of the photos published in Clarion Content! Clarion Content published my photo essay! MoogFest returns back to Downtown Durham, NC May 18th-21st . Talib Kwelli, Animal Collective, MYKKI BLANCO, and FLYING LOTUS are just a few of the top names on the high profile Sound Line-Up. There will also be over 100 workshops that will take place all over the city. Durham a.k.a BULL CITY, will open its Downtown to be transformed into a musical haven of concerts, demonstrations and exhibits. Durham, North Carolina (April 5, 2017) – Today Moogfest unveils the full schedule for the expansive four-day festival. Exploring the future of technology, art, and music, the festival includes more than 300 musical performances, daytime workshops, conversations, masterclasses, film screenings, live scores, durational sound installations, and interactive art experiences. *Please note, the full schedule can be viewed on Sched; however, registration and adding sessions to your personal schedule won't be available until sign-up opens Friday, April 7, at 12:00 noon ET for Engineer ticket holders; Tuesday, April 11, at 12:00 noon ET for VIP ticket holders; and Tuesday, April 18, at 12:00 noon ET for all ticket holders. Moogfest celebrates the legacy of Bob Moog, a visionary engineer who pioneered the analog synthesizer and other technology tools used by artists like Stevie Wonder, David Bowie, and Kraftwerk. This year’s program will feature over 260 innovators in music, art, and technology -- from Flying Lotus, Animal Collective, Suzanne Ciani, Gotye and Princess Nokia to Dr. Kate Shaw, an experimental particle physicist working on the ATLAS Experiment at the Large Hadron Collider, and Joe Davis, a pioneer in creating art with genes and bacteria at MIT Media Lab. Moogfest takes place in Durham, North Carolina, a fast-growing capital of technology, culture and entrepreneurship. Happening Thursday, May 18 - Sunday, May 21, with hundreds of artists, speakers, and sessions across downtown Durham, Moogfest contains a vast galaxy of discovery. Workshops are an essential part of the Moogfest program, as the platform prioritizes intimate spaces for collaboration and creativity. In these open learning environments, participants interact with technology tools that allow humans to creatively express themselves in new ways, so that we can design the future we want to see and hear. From the practical to the esoteric, workshops offer direct engagement with artists, thinkers and creators performing at Moogfest and empower the individual to affect the future. Possibilities range from Laraaji’s workshop on laughter meditation, to building your own light theremin or square-wave oscillator, to a contact mic workshop with underground experimental music figurehead Pharmakon, to a workshop where NEW INC will try to build a simulated utopia, to a class on DJ fundamentals for kids with renowned Detroit techno producer DJ K-HAND, to using laser projectors for generating abstract visuals, to a hands-on workshop on the basics of building modular patches for female and non-binary individuals, presented by S1 Synth Library. Below are some highlights from the over 100 workshops revealed today. There is still time to get prioritized access to our vast array of unique workshops. To ensure that you get your seat, consider the Moogfest Engineering pass where you can build a festival-exclusive synthesizer with a Moog Music engineer, or a VIP Pass that grants you access to all of the activities of Moogfest and select VIP areas. Masterclasses shared by Moogfest artists allow festival-goers and performers to work collaboratively in intimate environments that promote inclusion and involvement. Legendary DJs Greg Belson and Peanut Butter Wolf will impart wisdom and musical storytelling learned through a life digging through record crates. Artist Gotye will lead an intimate masterclass in the round on recently deceased electronic music pioneer Jean-Jacques Perrey’s life, musical genius, and signature electronic instrument the Ondioline. Video synthesizer designer and founder of LZX Industries Lars Larsen takes a moment to step away from the workbench and discuss the potential of modular analog video synthesis tools and workflow for the modern day video artist. Ableton Live founder and electronic musician Gerhard Behles discusses the democratization of access to tools to create music and illuminate new ideas. Reflect on how the last decade has been transformed by a host of arts-engineering software toolkits and engage with artists in the art of open-sorcery. In these workshops you’ll learn to breadboard a square wave oscillator from a single integrated circuit while revealing the electric DNA of the modular synth genome with Elliot Inman; spontaneously compose a radio piece with non-profit online radio station Dublab, Container and Elon Katz; learn to use affordable, off-the-shelf hardware and free open-source software to design real-time musical devices to dynamically generate music to foster mindfulness with Ico Bukvic, founder and director of Virginia Tech’s Digital Interactive Sound and Intermedia Studio. Moor Mother and Afrofuturist Affair guide workshops in this intersectional theory and practice that combines quantum physics, futurist traditions, and Black and African diasporic cultural traditions of consciousness, time, and space. Workshop participants will build future maps and quantum time capsules, shift cause and effect, and better understand the interaction between timescapes and soundscapes; use a DIY sci-fi lens to explore and reclaim mindspaces; create a sound space to combat oppression; and develop their own unique superhero identities. Sound lives in more spaces than stereo. Experiments with "Spatial Music" have informed composition since the early 1900s. But today, 21st-century technologies for audio recording, production, and playback have revived an interest in surround sound and the three-dimensional potential of electronic music. In these workshops experience spatial audio in a 3D audio Space Jam under the guidance of Virginia Tech’s ICAT faculty; learn ways to control spatial audio in a high-density loudspeaker array; learn how to code spatial effects using the free, open-source program SuperCollider; and hear how the power of immersive audio can become a compositional and audio-engineering tool to create new musical experiences. In a very special happening, synth design titan Dave Smith will lead a masterclass on one of his most iconic synths, The Prophet. Instrument tech pioneer Dave Rossum will host an intimate conversation that illuminates his unique path and designs. Moog engineer Michael Ashton will show his workshop participants how to build their own synthesizers, from concept to circuit board to chassis. The Engineer VIP Workshop consists of two three-hour sessions (held over two days) led by Moog engineers, where participants learn the foundations of analog synthesis and are guided through the process of building their own unreleased Moog synthesizer/sequencers. The synthesizers built in the workshop will be part of a limited run of 100 units. Where meditation meets mechanization, Techno-Shamanism merges technology with something more cosmic, ancient traditions with cutting-edge innovations, to tap into etheric energy and bring next-wave ideas into physical existence. Related workshops include a sleep concert/laughter meditation session with famous yogi, musician, and mystic Laraaji; a family-friendly exercise in yoga and waveform mandala art; and a conversation from Moog engineer Amos Gaynes about the connection between music, dance, and shamanic ritual. Exploration of the universal resonance of music and the astounding resource of modern technology as tools for resistance and designing a positive future--advances in science and society don’t have to spell dystopia. Educator, humanitarian, and UNC Music and Technology Professor Dr. Mark Katz conducts a conversation with acclaimed musicians and scholars on using music to advance social and political causes; Dr. Will Boone leads a presentation on the efficacy of blues and gospel music as a counter-resistance force; EDM/social justice nonprofit Give a Beat opens up a discussion on how dance music and tech can be utilized for addressing and recovering from the effects of mass incarceration. Artist and educator Taeyoon Choi leads a workshop on how to make compelling signage that effectively starts a dialogue, and Protest Stage performer Mykki Blanco leads a masterclass. Recognizing that children are the architects of our future, The Joyful Noise of STEAM offers kid-centric opportunities for exploring the exhilarating intersection of technology and the arts. Renowned techno producer DJ K-HAND will guide kids (and anyone else who’s interested) through the basics of DJing; Lile Stephens will lead students ages 10-18 in building a working light theremin; Philadelphia-based collective Metropolarity will help workshop participants identify their unique superhero identities then come together to create narrative art that tackles an issue of their collective choosing. Moogfest aims to illustrate the nature of our future ideas and creative industries. World-renowned figures in futurism, philosophy, and visionary art present daily keynotes on what art, creative expression, and the tools involved will look like in twenty, fifty, and one-hundred years. Armida Ascano of Trend Hunter delves into the possibilities and influence of the post-Internet generation; MIT’s artist-scientist Joe Davis will lead an exploration of interstellar communication; [descriptor] Dr. Steven Goldfarb, Duke professor Mark Kruse, and CERN scientist Dr. Kate Shaw will participate in a broadly-accessible discussion on the Large Hadron Collider and physics and math in developing countries. Moogfest is the synthesis of music, art and technology. Since 2004, Moogfest has brought together artists, futurist thinkers, inventors, entrepreneurs, designers, engineers, scientists and musicians. By day, Moogfest is a platform for conversation and experimentation. By night, Moogfest presents cutting-edge music in venues throughout the city. This mind-expanding conference attracts creative and technology enthusiasts for three days of participatory programming in Durham, North Carolina. Performing artists include early pioneers in electronic music, alongside pop and avant-garde experimentalists of today. Payment plans are also available. Simply select 'Monthly Payments with Affirm' as your payment method during checkout. More details are available here. I was thinking about all the things photography means to me and what great images do for society and one of the simplest things that came to mind felt so important. Photography is the evidence that we exist, of our dreams, of what we love and who we are. I am a photographer and I love the evidence. I keep trying to figure out how to start. I tried once upon a time as is my nature in my work but it felt silly because the characters I create are fairy tales, I am not. Although I do like to see my struggles and aspirations in that light and I do go as far as putting myself into some of the illustrations of those emotions. That tends to be how I am able to sometimes deal with those feelings. I was asked recently at my final portfolio presentation to explain why I make the work I do. Being close to graduation, like many I have been pulling all nighters for weeks. Sleep deprivation does not help to answer these kinds of soul searching questions. Instead I blurted out because I have to. I did not say because I like to or because I want to (any of these answers being far to simple and obviously unacceptable anyway, but there it was) I knew in the moment it came out of my mouth, it was in the far simplest terms the truth. Once the idea has sparked the wick, it feels as though time has started ticking down for me to figure out how I will lift a feeling out of my heart and head and encapsulate it onto another surface. I become driven and as one professor commented, insatiably creating (this was not meant as a compliment, but in truth I took it as one). What I want to do in this blog is share the process I use to create as I am creating good, bad, ugly. Blood, Sweat, tears, triumphs, failures and all. I realize that the many artists I admire and find the most connection with are the ones that share, they invite you in on their journey. I intend to do the same in my own way. As I go through this process I will be also sharing the names of the people who inspire me as well as why. I invite your participation, patience, frustration and most of all experience. A lonely journey is not what I am looking to embark on.